As I’m sure you’ve noticed, I’ve really been getting into fish. 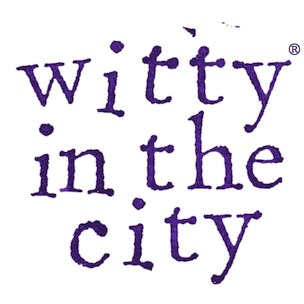 It’s like a whole new world! I am having a great time trying out all of these new techniques and flavors. Although breading and pan frying aren’t new, a cornmeal crust certainly counts as adventure around here. I bought four tilapia filets to serve two people, but it turns out that one filet per person is plenty. 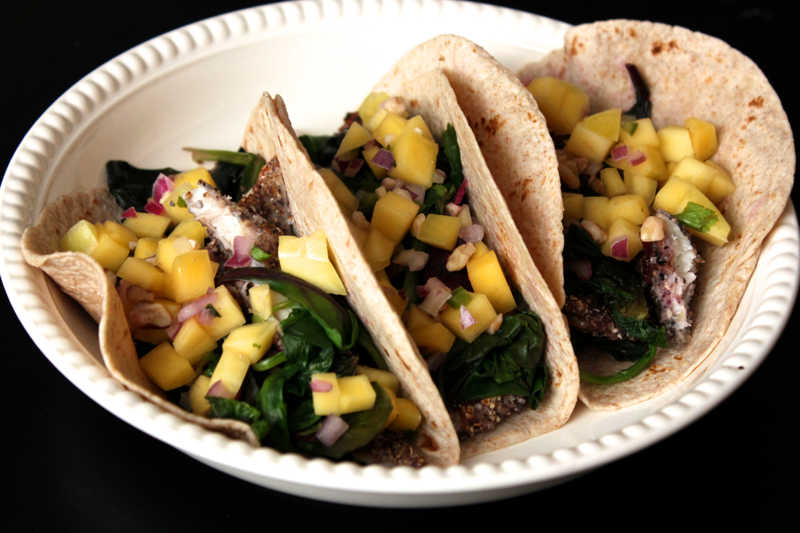 I used the opportunity to create two separate meals out of the same two meal components: cornmeal crusted tilapia with Cuban black beans and green mango salad, and cornmeal crusted tilapia tacos with wilted greens and green mango salad. I really cannot decide which version I preferred more…so make both! 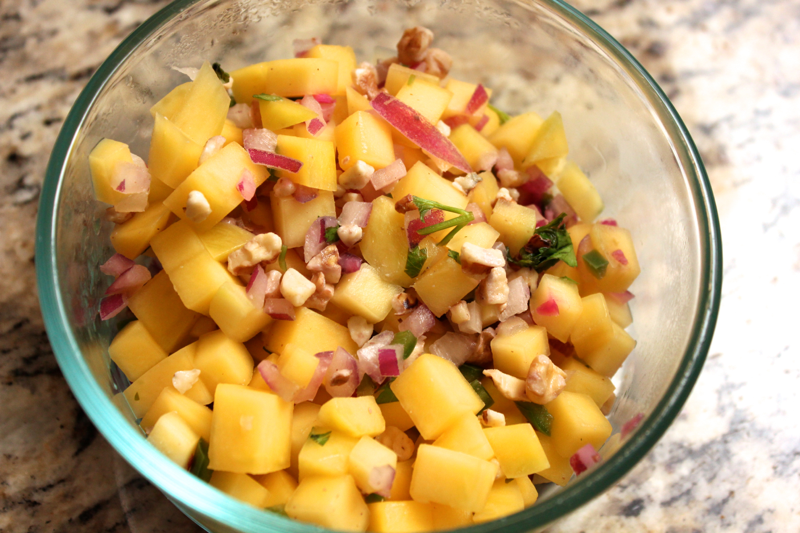 Regardless of which meal you want to make, start out by preparing the mango salad. Get 1 green (unripe) mango, and peel off the skin. Dice the mango into small cubes that are 1 centimeter or smaller. Add the mango to a bowl. Finely dice 1 jalapeño pepper and 1 shallot, and add them to the bowl as well. Mince up about 1 tablespoon of fresh cilantro, and add it to the mango salad along with 2 tablespoons of lime juice. Season the mango salad with salt. Before serving, stir in some toasted walnut or pecan pieces to keep them crisp. Then, move on to the fish. In a small bowl, whisk one egg. In a shallow dish, pour out some cornmeal and mix in salt and pepper to taste. 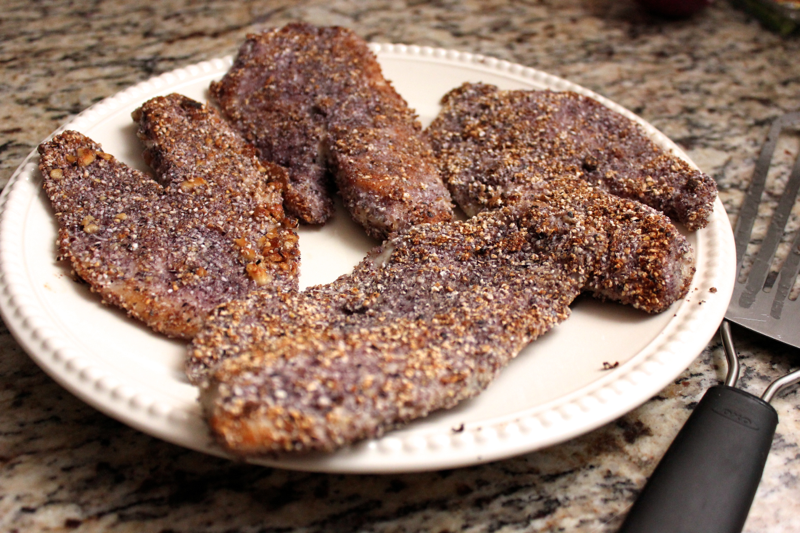 I happened to have blue cornmeal, so I used that instead of the normal, yellow stuff. Dunk the fish into the egg, let the excess egg drip off, and then coat the fish completely with the cornmeal. I experimented with adding some nuts to my cornmeal crust, but I didn’t think the extra effort was worth it in terms of flavor. Heat a pan with some oil, and add the tilapia filets. Once you see the fish starting to turn white up around the sides after about 2-3 minutes, flip the filets over and let them cook on the other side until they have firmed up, about another 2 minutes. If you cook the filets in batches like I did, you might have to wipe out your pan between rounds to prevent loose cornmeal from burning up. 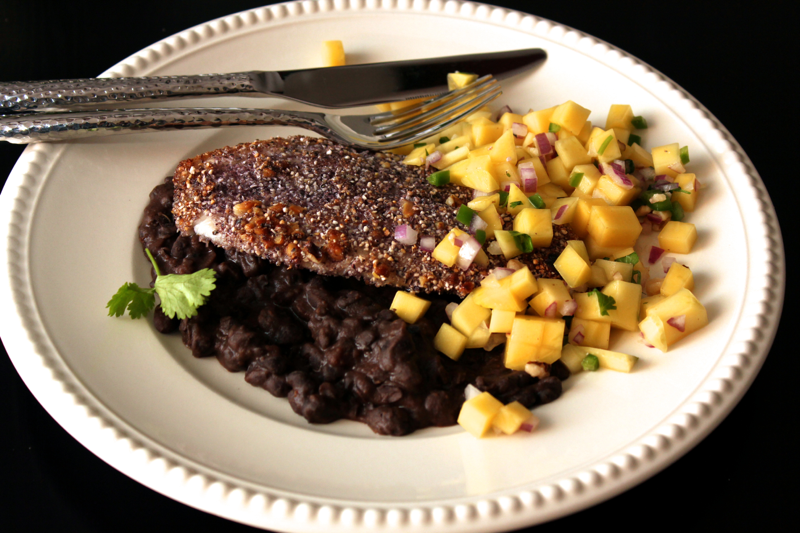 I first served the crusted fish over warm Cuban black beans, sprinkled with a generous helping of the mango salad. The flavors went really well together, and the fish had a wonderfully crunchy texture and a very mild flavor. With my leftover tilapia filets the next day, I made fish tacos! I reheated the fish on a baking sheet in a 350º F oven for about 10 minutes until it was warm throughout. I did not want to overcook the fish in the reheating process, however, so it never got as crispy as it was fresh out of the pan. The cornmeal still provided a nice crunch though. To make the tacos, begin by adding a few tablespoons of water to a pan and heating it over a low flame. Add in 4 cups of field salad greens (it will look like a lot, but go with it), and put a lid over the pan. After a few minutes, the salad greens should have wilted down. Stir them until they come together, and then set the greens in a strainer to drain. Wrap a stack of smaller tortillas in tin foil (I prefer flour tortillas), and put them in a 350º F oven for about 5 minutes to warm through. Once they are warm, place some of the drained greens down the center of each tortilla. 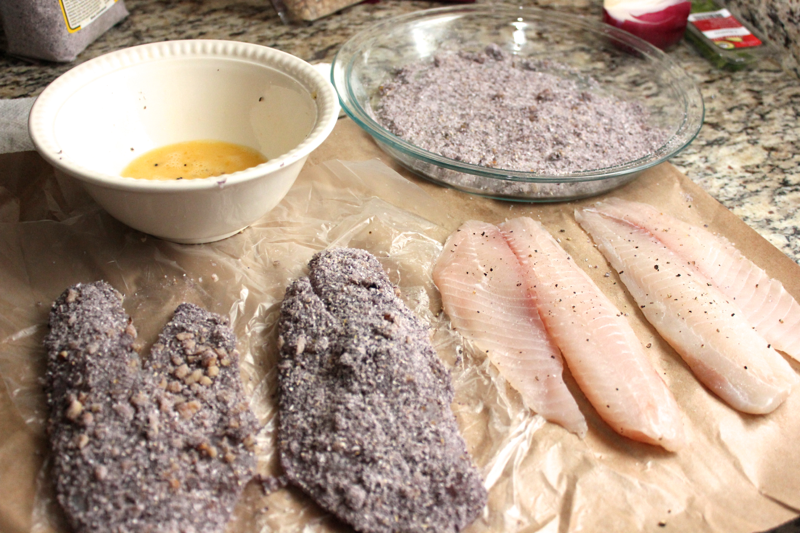 Slice the crusted tilapia into 1 inch strips, and add the fish on top of the greens. 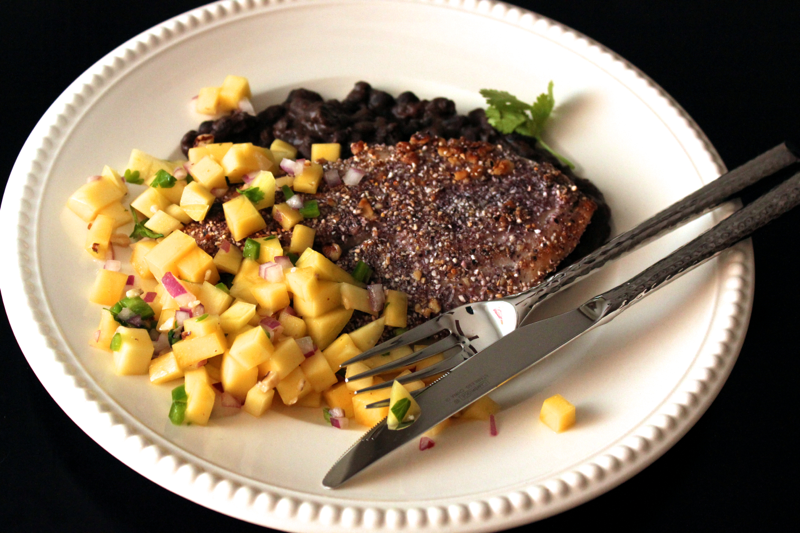 Top the fish with a healthy sprinkling of the mango salad. Squeeze fresh lime juice over the taco fillings, and add hot sauce if you like extra heat. Some creamy avocado would also be a welcome addition. Fold those tacos over and scarf them down. I really enjoyed the earthy flavor of the salad greens with the crunchy fish and refreshing mango. This meal did not feel like leftovers.